Rich, custardy and flavor-packed, this gratin certain to become a holiday favorite, enjoyed equally as a kid-friendly side or for a very grown-up brunch. We adapted it from from a recipe by Martha Rose Shulman, the wonderful champion of vegetarian cuisine. Prepare your squash: preheat the oven to 400 F. Cut the squash in half, place face down on a cookie sheet or a glass baking pan, add just enough water to cover the bottom of the pan and bake 40 minutes or until soft enough to easily pierce with a knife. Remove, reduce the oven to 350F. Turn the squash over to cool and when easy to handle, scrape out the seeds and discard. Scoop the remaining flesh into a food processor or a mixing bowl and mash. You should yield 2 heaping cups of flesh. Heat the oil in a medium-sized sauté pan and add the onion. Cook, stirring, until onions become fragrant and translucent, about 5 minutes. Add the garlic and cook another 2 minutes. Add the sage and cook until fragrant. Add the squash and the parsley; remove from heat and season with salt and pepper. In a medium-sized bowl, beat the eggs and add the half and half. Fold in the squash mixture and add the grated cheese. Transfer to a buttered baking/gratin dish, sprinkle with Parmesan and bake 30-40 minutes, until lightly browned on the top. Serve hot, warm or at room temperature. Serves 4-6. 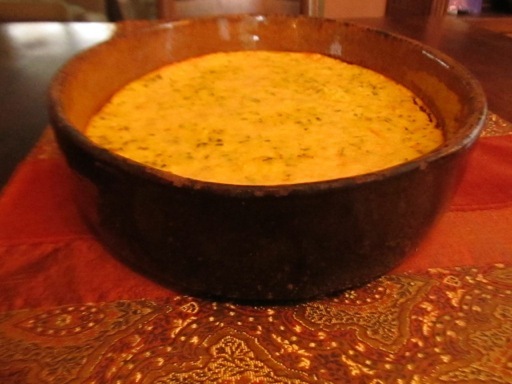 This entry was posted in Brunch, Main Courses, Recipes, Recipes from Danielle's pantry, Sides, Vegetarian and tagged cheese, cream, eggs, milk, onion, Onions, paremsan, sage, squash, vegetarian. Bookmark the permalink.